- Construction Company: Pentamar S.A.
San Isidro Labrador is located a few kilometers away from the Capital City and has fast and secure accesses. This gated community houses within its grounds C.A.S.I. club, offering its residents the possibility of becoming members of a first-class sports complex. The club has 50 hectares destined to the traditional sports activities : rugby, hockey and tennis. It also has an important golf course, sailing and rowing sports which are added to the great variety of activities the place has to offer. The mentioned sports take place at the port of mooring, which offers direct access to Luján River through García Channel. The lots are wide and with a view to common areas, offering in this way green and aired landscapes. Because they are located around the club, their owners can enjoy the peacefulness of the area as well as complete security. Santa Catalina is the first stage of one of the projects forming the 700 hectares of Villa Nueva Complex. 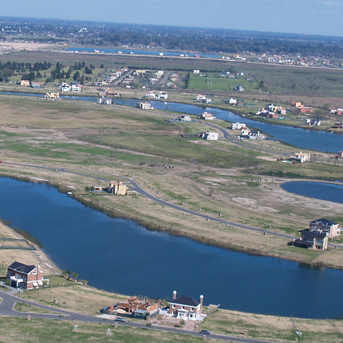 They present the characteristic of being located over Villa Nueva Channel, which means a direct connection with Luján River and an excellent access to the Delta. 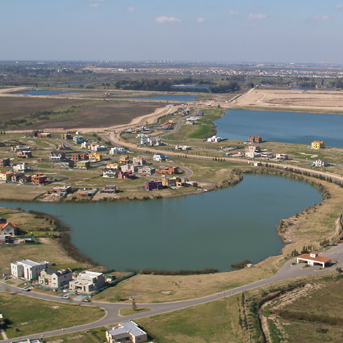 The development has a port of mooring and an inner lake of 60 hectares. The avenues, with a great variety of shapes, offer a natural and relaxed landscape. A great number of its lots border wide peninsulas, which allows them to have their own moors, offering privacy and a comforting sense of belonging. The owners of the interior lots have the possibility of acquiring a moor at the sports port. Santa Catalina offers a privileged location , allowing you to enjoy the landscape, nature and the peacefulness of the place. - Construction Company:	Pentamar S.A.
A magnificent water mirror occupying half the total surface of the gated community, offering a lot of free space where you can ease your eyes in a relaxed landscape. Another advantage of the development is the small number of lots it will offer, giving the place low habitation density. Some of them will go round the coast of the lake, while others, located in the ISLAND , will offer an exclusive landscape in a personal and warm environment. No engine water sports. 50 % of green areas and water. An Island with exclusive lots. Santa Clara is integrated to Villa Nueva as the third stage of the Master Plan. As well as the other gated communities, it will enjoy the advantages given by this important complex of 700 hectares : a commercial area, with an important infrastructure, cultural centers and schools. A product of exceptional quality. 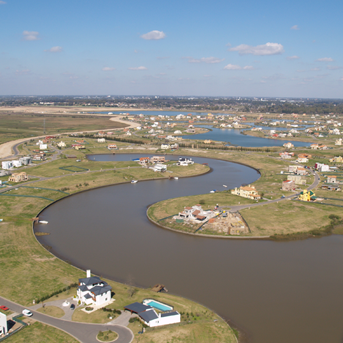 Its design joins the characteristics distinguishing and giving prestige to Santa Bárbara: lakes, islands and bridges, with the most outstanding characteristics of Santa María : direct exit towards the river and plots with wharf. Located in Benavídez, close to Club Newman, a Villa Nueva, together with Santa Catalina. 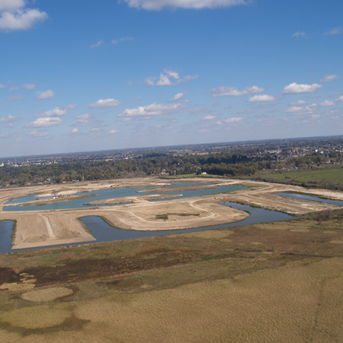 357 lots, of 900 square meters average, of which 25% are river front located, 60% with a view of the lakes and 15% terrestrial. Designed with internal islands, lakes, bridges, lots with moors, exit to Luján River. You will enjoy the good accesses and shopping centers of Nordelta area. It is close to the commercial center of Maschwitz.